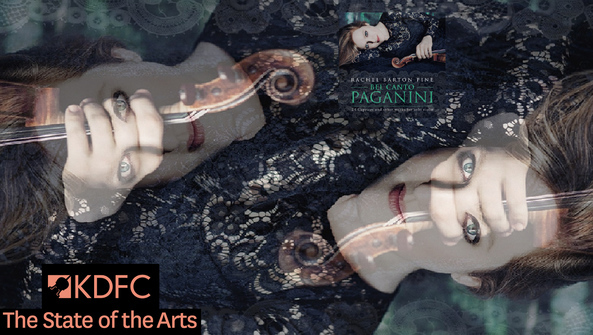 On the latest release from Rachel Barton Pine, Bel Canto Paganini: 24 Caprices and other Works for Solo Violin, the violinist plays all of the 24 famed Paganini Caprices, plus a few other works by the virtuoso composer. She sees them as much more than just flashy examples of what the instrument is capable of, especially after deciding to play all the repeats that Paganini indicated. "All of these years, I've been striving to treat Paganini's music with just as much respect as any other serious composer," she says. "Not to treat his Caprices as mere fireworks, just showy pieces, but really to find the musicality in each one, and what its character is. If I were recording Beethoven or Schubert, or anybody else from the early 1800s, I would pay attention to what repeats they indicated. And Paganini is very specific, sometimes he wants repeats of the first and second half, sometimes only the first half… So he obviously meant it, it wasn't just there for convention's sake." Making that decision has helped her discover hidden depths to the Caprices. "It makes you learn things about them. Certain ones are longer, the proportions between them are different, and you know, the onus is on the performer, on me, to make sure that I can sustain the interest with doing certain repeats and hearing the music again, but the music is great enough that it really does sustain that." Pine decided one way to help be faithful to the spirit of Paganini was to think of vocal lines. "I actually coached with an Italian opera coach because Paganini's music comes from the same time as Rossini and Verdi and all of those quys. And so I wanted to make sure that it had that flavor."